A celebration at West Seattle High School tonight as another of its senior basketball stars signed a letter of intent for college – Abdullahi Mohamed is going to Eastern Washington University. Teammates and other schoolmates watched and applauded the brief ceremony, as did the player’s family. Abdullahi and his teammates, with head coach Keffrey Fazio (below left with Abdullahi and his mom), will hit the court next weekend in a preseason jamboree at Chief Sealth International High School. The Wildcats’ first home game is Saturday, November 30th, vs. Ballard. 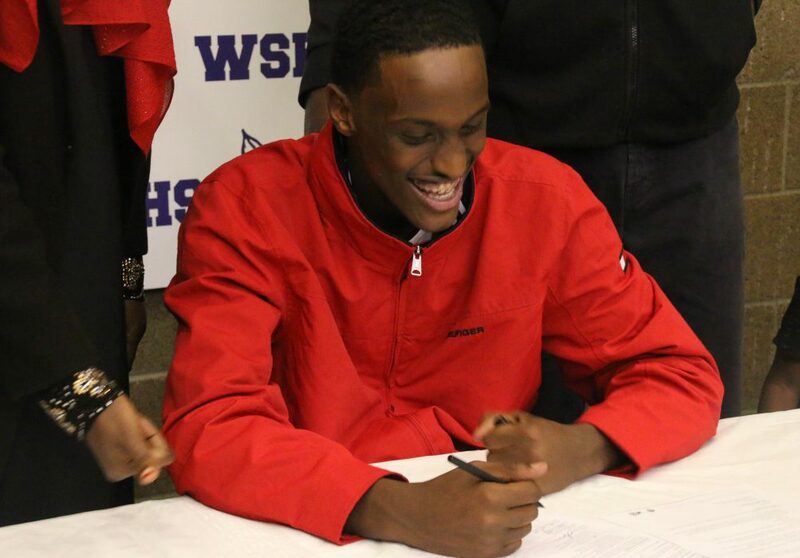 6 Replies to "VIDEO: West Seattle High School celebration as Abdullahi Mohamed signs letter of intent"
Aside from being a fantastic athlete, Abdullahi is just an amazing young man. His intellect, confidence, respect for others, and commitment to his family are just as great. An outstanding member of our community! Congratulations Abdullahi! Congratulations Abdullahi you are a success and a bright star West Seattle is so proud of you! Definitely going to make it to some games this season. Congratulations, you have an amazing future ahead of you! Love these signing celebrations! Congratulations, young man! Way to go!! Big Congrats to this young man!